The problem is that I'm running out (no pun intended) of interesting routes. An ideal route is the one that doesn't repeat itself on the way back and provides interesting neighbourhoods or views to observe, so I can use some planning here next time. 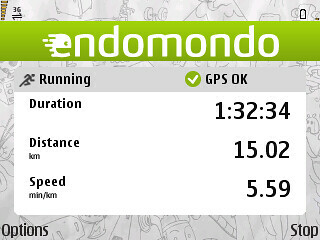 Also, I can recommend you the Endomondo tracker app. I used Nokia Sports Tracker before but Endomondo can count kilometres/laps and say the stats when another one is hit, so you don't even have to look into screen. Very convenient.